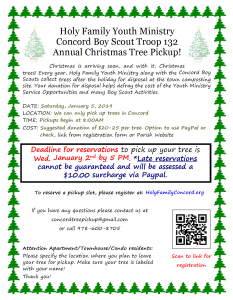 Save yourself the hassle and let the youth of Concord dispose of your Christmas Tree this year! Holy Family Youth Ministry along with the Concord Boy Scouts collect trees after the holiday for disposal at the town composting site. The trees can only be picked up from Concord locations.